"ComicCon always makes me think I should be making a new comic book." I'm pretty sure my costume echos what the others said, 'HECK YEAH'! Waitaminit - Are you one of these costumes? WHOOO! YES! More Steve Purcell Comic Books! How much money do oyu want form us and how can we get it to you? Great to see you in San Diego! Didn't I actually meet you at WonderCon last year? Steve, it would be a great time to release a new comic, what with Sam & Max's recent revival and now its hitting all the consoles..
Oh I can't believe this, I was convinced you weren't in San Diego because you didn't have a table under your name this year. Oh, how foolish am I. A new comic book would indeed be a good idea. As a poor young guy from a rich small country in middle-europe I still missed to much of an great comic-cultural era. 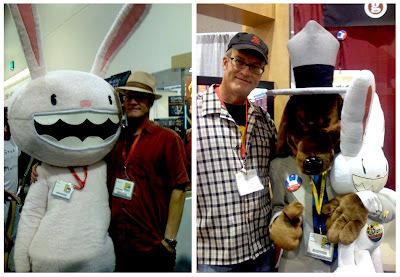 But if you would make a new sam&max comic - i will travel as far as necessary to get one. Just to take part of the event. An I even will not loot it.